A South African team won’t win Super Rugby again until we create a system where the focus is on quality and not quantity. The schizophrenic nature of SA performances across the board is the result of Super Rugby teams being decimated by players signing for overseas clubs, poor recruitment systems and a lack of willingness to hunker down and focus on retaining a core group of players for a long period of time. That’s been the secret to the success of the Lions over the past few years. Coach Johan Ackermann offered a lifeline to a number of players thrown away from other unions, built a unit based on trust and mutual respect, and allowed the players to flourish. Now that this bond has been broken, we’ve seen players like Ruan Dreyer, Franco Mostert, Rohan Janse van Rensburg, Jaco Kriel and others head north, with more stalwarts of that side likely to follow. And while it has worked for the Lions, we mustn’t forget it was by necessity rather than design that this came about. Relegated from Super Rugby, the Lions offloaded a number of players in 2012, returned to basics and built their franchise up again from scratch. Unfortunately, they haven’t stuck to that model, and neither have the rest of the SA teams. Craven Week is in Paarl this year and that means cash-flush provincial scouts have flocked to the Western Cape from across the country to sign the brightest young talents in a coup for their home franchise. But the bottom line is that the contracting formula made popular by the Bulls more than a decade ago simply doesn’t work anymore. Back then, Ian Schwartz, a wonderfully astute High Performance Manager, recruited players left, right and centre from right under the noses of rival unions and, together with Heyneke Meyer, built the teams that would go on to win three Super Rugby titles. The other provinces have since caught on, and now they all do it. It’s a bidding war for juniors where contracts fetch close to one million rand for an Under-18 star, even though there’s no guarantee the player will actually make it all the way through to Super Rugby. The Bulls High Performance department still signs 120 juniors to the union and, with that, they have claimed a sum total of four titles – three under-21 and one under-19 trophy in the past seven years. There have been no senior trophies and while they perennially have the largest group of players in the SA under-20 squad, what does that mean in the larger scheme of things? Ironically, the Lions have now surpassed the Bulls’ efforts in applying this contracting model and they too will find out soon enough that dominating junior rugby and hoping it translates into the senior ranks simply doesn’t work. 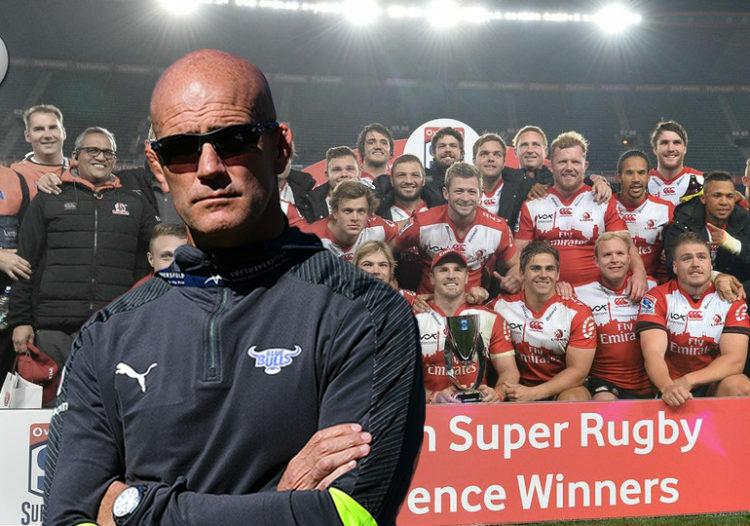 This past week, Bulls coach John Mitchell hit the nail on the head when he said it was a joke to expect SA sides to win Super Rugby in the current situation. “Every South African team suffers, we don’t have squads that are entirely Super Rugby quality, and until we create that, we won’t give ourselves a chance to win this tournament,” Mitchell explained. Too often our franchises are guilty of trying to win every cup on offer – they focus on quantity and not on quality. Many franchises in South Africa have almost bankrupted themselves in trying to keep up. Following on from my call to cull both professional provinces and an overstock of professional players in SA, it is time for teams to focus on quality again. Instead of having a senior Super Rugby squad of 60 players – the Sharks and Bulls are two prime examples here – recruit a squad of 40, all of whom can and will play throughout the year. There are too many examples of players carrying tackling bags for most of the year. Pool the resources better, ensuring better contracts for those who make it, and bolster the Varsity and Gold Cups with the rest. Sure, we will always lose a few players here and there to overseas teams, but there is a cap to everything. Stronger, more focused resources will lead to stronger Super Rugby squads. This in turn will lead to a stronger, more focused Springbok squad. Professional rugby in South Africa needs a reality check. Unions that contract 150-180 players are weakening the system at its base. It needs to stop. I feel like I’m having deja vu here, you sure this not a rehash of previous article of yours Brenden? Not judging, its as relevant as ever. Retaining your core group through age-groups into senior teams is much better. We have to have faith in our young structures, but not in the sense of million-rand contracts for 18 year-olds. And with a draft system being discussed now, perhaps it may be better. Having 3 or 4 top SR quality flyhalves in one team is just stupid. Each to develop their own as much as possible and drafting players that become eligible to specific teams. Tackle bags does not give you “exposure” as actually playing, obviously. 40 players? That in itself would cause even greater burn-out. SR is hugely taxing on a players physical and mental reserves, then also play in the super sport cup and curry cup…what? We see SR players coming off injury or those not required immediately often playing in the super sport cup to get fitness and sharpness up to speed. Greg, a lot of the problem is coach and selector based. For example, Mvovo was forced into the stating team through injury, and he won the Lions game, Kobus Van Wyke is another who has hardly been used and he really looked good. I thought John-Hubert Mayer, had immigrated because we have not seen him for months. What of Garth April and when will Bosch get a chance again at 10? We tend to leave the blame at the players doors, but really the coaches do the selections! John Smit changed the way the sharks scouted youngsters 4 years ago and said that the sharks will not sign lots but focus on one or two top players and local school boys so … we have been having it. Mr Nel, Using the Lions as an example in your article is a cop out. Two SR finals in the past two years and but for a knee jerk ‘red card’ by our very own Peyper and your argument would have had no validity whatsoever. By all means pick on the other Franchises who have been on the road to nowhere these past few years with poor coaching and even poorer game plans but leave the only team who gave our rugby some respectability alone please. Even in a year when they have been below par they still are the only feasible chance we have of picking up the trophy. If I recall the other three Franchises were being heralded as real contenders this year back in February and the scribes were all singing their praises before they had even kicked a ball in anger. Six months later and it’s possible they will finish tenth, eleventh and twelfth on a 15 team log. Mitchell who coaches the Bulls calls our SR a joke when he is being paid big bucks to coach the Bulls back to the top and keeps reminding us that they are on track. What a negative way to motivate his charges, I don’t think. How many articles are spewed out daily saying we have the talent etc, etc. So what is the problem ? Poor coaching, poor game plans and players who do not have the mental strength and skill to make the adjustment to SR is where the problem is imo. Mitchell is still on trial but not doing well at all while Fleck and Du Preez are just plain not qualified for the job. If money is to be spent then what must take the highest priority is the importation of suitably qualified overseas coaches. These current guys brought up on dom krag 101 simply do not have the rugby nous to bring their teams on. Poor adminstration coupled with coaches out of their depth and players rushed off the assembly line too soon is the real problem here but the Lions proved that it could be done. No Sir they never ‘stumbled’ on success they planned it while the others, including some scribes, looked on with contempt at their audacity to play expansive rugby. If only all our Franchises had a similar vision four years ago our rugby would have been in a far healthier state now. We have the talent we just need suitably qualified people to harness it. Cheers. Once again, Herman, you have some very valid points, ruined with some very ‘dom’ thoughts indeed. Sorry if you take that the wrong way, maybe a blanket and some tea would soften my cold truth? Anyway, you go on a very valid argument which I back 100% in your third and fourth paragraphs, which in fairness is all you should have written. Well, only the first half of the fourth paragraph. The first two paragraphs are just your emotional response at someone pointing out some flaws with your mighty Lions team. I was looking forward to your comment as I thought you would be able to see the wood for the trees but sadly you only saw half of it. Using a successful franchise such as the Lions as an example in Mr. Nel’s article was rather good. He highlighted just one of the many problems our franchises are facing. Yes, you hit the nail on the head with the coaching and administration but don’t you think that Brendan Nel has a point that the Lions had to change their approach because they were the worst SA side and kicked out of the SR competition? If you want to argue the merits of a union you should also admit the flaws and the path taken to get to this point of dominance. And please don’t go on a tangent about being unfairly kicked out due to politics. We all know that story. With the weak rand, we need to find a way to retain the best of the best. The only way to keep all those Lions players in SA would be to pay them more and guarantee them every chance of making the Boks. 40 players in each franchise squad would certainly free up some cash to both keep the best players here and invest in better coaching. Objective, emotionless analyses would form that conclusion every day of the week. Also, less rugby would be better to ensure the freshness of the product. Good luck, I look forward to whatever you may write, but I suspect it will be completely subjective. Grant. or should I say ‘Rant’, once more thanks for your ‘qualified’ agreement with my post but as usual you use an ‘indian giver’ stance where you praise on the one hand and slap me with the other hand. Once more you take up an almost ‘censorship’ role on the site which again ignores my right to structure my posts as I see fit. Unless there is a cap on how many words a poster can use I reserve the right to do as I please. I even grant you the right to disagree with me as long as you tell me your reasoning so I can respond appropriately. Stop taking your eye off the ball my friend. As for my first two paragraphs please advise me what was not factual in them ? I was merely setting out the reasons why I didn’t agree with the writer. However according to our designated censor ( yourself ) my post was ‘dom’. An old saying goes – he who resorts to personal insults has already lost the argument, lol. All I was demonstrating is that if SA rugby has been so pathetic these past few years due to all the negatives in our rugby set up how come the Lions could do it and no one else over that period ?. Were the Franchises not all facing the same problems ?. Please feel free to respond. By the way the Lions were not kicked out of SR they were told to vacate to allow the Southern Kings to compete in the competition. A case of SARU pandering to their political masters if truth be told. A fat lot of good that has done. Since 2013 up to now ( five years ) the Kings still continue to fill the last spot on any competition they find themselves in and the team still remains ‘white heavy’ whereas the whole idea was to develop ‘ black’ rugby in the Eastern Cape. Another exercise in futility imo. To answer your question therefore about Mr Nel’s comment about the Lions having been forced to change their playing style the answer is an emphatic NO. The Lions had a year to sit down and strategize their game plan, administration and player complement. They woke up to the fact that in order to compete with the NZ teams you needed to score tries and they set about that with a vengeance. Even in a below par current season they still have the most tries scored in the competition. That very fact, due to the bonus point situation, has offset their ‘unlucky’ losses and that’s why they are still in the running. Simple really. In the meantime the other Franchises floundered and refused to accept the blueprint the Lions offered them, preferring the failed dom krag system and the rest is history. If I must really rub salt into the wounds then let me add that if the Sharks lose on Saturday we will have the three Franchises at 10th, 11th and 12th on a 15 team SR log and that Sir is unforgivable. People like you accuse me of punting for the Lions continually but if one is honest there has been no else one could have got excited about these past few years. Hence the envy and derision from some quarters with their success. I rest my case. Cheers. Oh Dear Herman, I see everything is lost on you. You did not get my whit, banter or the respect I gave you. At this point, I feel it is not worth my effort trying to engage you in a constructive objective debate as you immediately go headfirst, eyes closed into your tried and trusted methods of subterfuge and victimization. I explained everything yet you failed to even grasp anything without subjectivity. Objective reasoning is something you just don’t possess or even understand. I rest my case, permanently. Good luck and Farewell Herman. Rant, what a pity but maybe it’s for the best, too much hot air being blown around anyway. I trust that you will be four square behind the Lions for the rest of the season where we hope to bring the trophy home despite our below par season so far. Maybe as underdogs this year we can surprise a few people. So go in peace my good man and remember it’s only a game. Cheers. Brenden, we seem to have developed an inferiority complex, assuming we are not good enough and that all New Zealand is great. Whilst our past few years at National level have been abysmal, this was largely Coach driven! The fact is that our SA super Rugby sides, are hugely disadvantaged through travel and time away from home and through this they have little chance of success! If you add to this poor coaching then you get a clearer picture of SA Rugby. In my view the Lions success was about the ability of the their coach (Ackerman) and not about squad size! Consider for example, Wessels (Rebels), Erasmus, Ackerman, Jones. These chaps have the ability to create success regardless of squad size! I tend to agree with what you are saying but one factor none of those coaches had to endure was quota fulfillment….Ackers included, he left prior to SARU becoming ANC B!tches…and again nothing cracks me more than good players being labeled development or quota placements…. The other key issue is that we overplay teams into complete exhaustion, NZ squad rotation wasn’t pretty at first but they have now almost perfected the art….when the Bulls dominated it was because they didn’t lose home games and won Local away games….that’s the key…target a percentage of wins and travel long distance with rotation players, when the rotation players perform and earn a starting place you also bank points. For lack of a better anaology “pick your fights”…. This is not new as SARU is currently prolonging this debate but they are moving into a draft system where in ur top three or four scrumhalfs will be spread across to differentbteams to ensure they start week in week out. Sarugby is moving in the right direction albeit slowly. Where did you find evidence of this? I found this article interesting and thought provoking as are the comments made above.I believe we have lost our way against NZ teams by trying to be better at their style of play instead of playing to our strengths. Players are criticized mercilessly….for playing to coaches instructions! Players are chosen because of certain strengths and then told to do things differently. It is my belief today that the black players (and I will call them black because that is nothing to be ashamed of and I do not believe in treating anyone differently because of skin colour, hair colour, eye colour, different language or religion. That is crap I dont have time for. Treat people the same. Regardless. Pandering up or down is wrong) in the Springbok team could make any team in the world on merit alone. It is ludicrous that a quota system is even spoken of these days when we now have sufficient merit players. In the past when it was needed, nobody mentioned it. Why start now? The biggest problem imho, is the unhappiness which was so evident the last two years in the Springboks. This unhappiness points to unspoken things going on behind the scenes. For some years I have been advocating that SA get out of SANZAR and join up with the Northern Hemisphere in a competition or two. The travel requirements are less ardous and taxing. The type of rugby played there is closer to SA type of play. Financially it also makes better sense. We will get better referees (a touchy subject I know, but referee standards have been declining) We would become a force again in world rugby I sincerely believe shiould we get out of SANZAAR. Also, the financial gain would enable us to hold on to our players better than we are currently able to. These are just some of my thoughts. Many more to come. Glenn you make some very good points which I agree with but I still believe unless we can beat NZ more times than not we won’t be able to progress. The Lions proved we have the players and a game plan to challenge them. It’s therefore up to the rest of our Franchises to adjust their own rather conservative game plans to meet the challenge and put more pressure on the NZ SR teams and ultimately the AB’s in test matches. The Northern Hemisphere option has merit but how does one prepare for NZ if we only play them on a piece meal basis ? NH rugby has improved dramatically over the past three years so where will we fit in on the test calendar and seasonal differences could also come into play. Also I’m not sure what you mean by a SA type of play. If you mean a conservative no frills style where you soften up the opposition with sheer physicality and the overuse of the boot then I’m not sure we will improve to any great extent. It hasn’t worked since our glory year back in 2009 at test level or any other level if truth be told. Even the NH teams, think Ireland, play a much more expansive style than years gone by. We have the talent here believe me but we need world class coaches to bring them on using the NZ template. Let’s be honest watching their SR derby games is a treat and we need all our Franchises to find that higher level. Cheers.